Ross Kay, J.F. Shea Co.
With his niche legal expertise and wealth of connections, Kay is a leader on the sharp business team behind veteran construction firm J. F. Shea Co. It all started with plumbing. The year was 1881. Aiming to provide for his family by doing what he did best, John F. Shea set up a small plumbing shop in Portland, Oregon. It didn’t take long for business to pick up, and in the following decades, supported by his sons, Shea expanded his reach into homebuilding and general contracting. Now, more than 130 years later, Shea Homes is one of the largest privately held homebuilders in the United States, and other J. F. Shea Co., Inc. companies touch everything from heavy construction to venture capital to commercial development, construction, and management. It’s this very diversification that has allowed the company to weather even the roughest industry waters. Because its work is more than digging holes and putting up walls, the firm has cultivated a sharp business team to support its continued success in and beyond construction. Ross Kay, senior vice president and general counsel for Shea Homes, belongs to this important group. 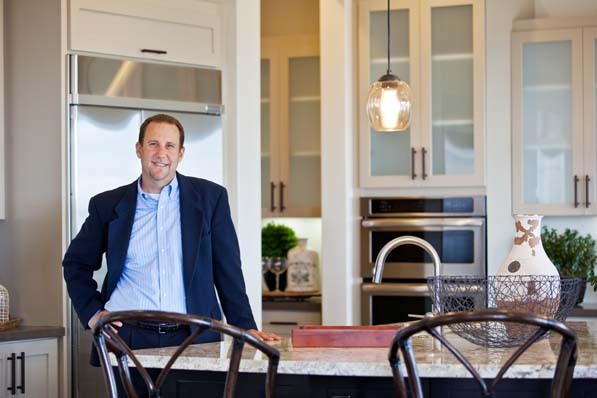 He joined the company in August 2012, and, backed by nearly 14 years as in-house counsel for KB Home, he has helped J. F. Shea Co. revise and expand its network. Kay’s work is largely split between Shea Homes and the firm’s heavy-construction projects as a large-scale civil contractor, including work on the Golden Gate Bridge, the Hoover Dam, the San Francisco Bay Area Rapid Transit System, and many others. “Shea does joint ventures for a lot of its heavy-construction deals, and because these are public projects involving big dollars, it’s very competitive,” Kay says. A residence in Shea Homes’ Vista Vallarta community in Alisa Viejo, CA. On the Shea Homes side, the focus is on homebuilding and master-planned community development in seven states reaching from coast to coast, with a particularly significant presence in the Southwest. The company’s work earned it recognition from the NAHB and Builder magazine as one of America’s Best Builders, and it won the Builder of the Year award from Professional Builder magazine in 2007. In 2011, the division was also named a Customer Service Champion by JD Power & Associates. Because the firm’s work extends nationally, Kay says it’s important for him to form strong connections with outside counsel while still strengthening ties in-house. During his time with KB Home, working with 17 direct reports, he oversaw construction matters across the country—a purview that allowed him to build his own network of contacts while also reinforcing the importance of cross-counsel communications within the construction industry. “I’m a big believer in inside counsel, partly because we know the business, and partly because it’s more affordable to staff a project with inside counsel,” Kay says. Shea Homes’ Vista Vallarta at Glenwood community in California’s Orange County features single-family homes built alongside a Jack Nicklaus-designed championship golf course.